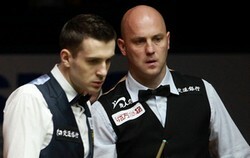 Selby and King played in last year's quarter-finals in Shanghai and Selby won 5-2. However King beaten Selby on this year's Masters when Selby was the defending champion. This time Selby even had an effortless win 6-0 over King. Selby won the first four frames with 60, 53, 49. King had a really good chance to pull one back in the following frame. Selby missed at 49 and King got 64 in a break. Unfortunately, he snookered himself on the final yellow and cueball was off when he was trying to hit it. Selby cleared the table to lead 5-0. Eventually Selby won the last one with 71. 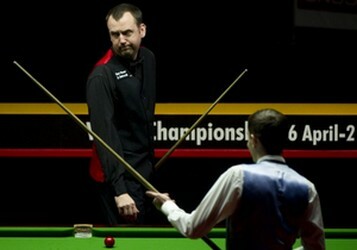 Mark Williams joined Selby in the final tomorrow by edging out Neil Robertson 6-5. The match started with Williams taking the scrappy first frame before Robertson levels 1-1 with 72. Williams then hit the only century in the match, 100 and followed by 52 in the next frame to lead 3-1 before mid session. The dramatic part came in the fifth frame. Williams received 39 foul points while Robertson received 38 foul points due to high-quality snookers. Robertson was the one who took the fifty minutes frame to trail 2-3. Williams extends his advantage to 4-2 with 47 and 30. Robertson came from the back with 74 to overtake Williams's 58 to win the next frame. Robertson found his confidence after the frame. He caught mistakes of Williams to level 4-4. Robertson took the lead for the first time in the match 5-4 before Williams had an amazing clearance to force a decider. The two players had an intense decider with numbers of misses. Robertson cannot obtain the three snookers that he needed to win the match. Williams had a tough win 6-5 in four-hour match. Last big meeting between Selby and Williams was the German Masters this year. Williams won that wonderful final by 9-7. Selby cameback to level 7-7 from 4-7 down but Williams stopped his further action. I have a high expectation for tomorrow's final. Selby must have enough rest compare to Williams. Williams has better preparation for tough battle as he came through tonight's match. It is really hard to tip who is going to win the title as two Marks are running for the number one spot for the next cut-off point. Williams must win this one to keep his hope remain at number one alive. If not, Selby will become the new world number one. Look forward to tomorrow's final.